The section from Šugarska duliba to Stap offers genuine wilderness, with forest calm and tranquility dominating this wide area. 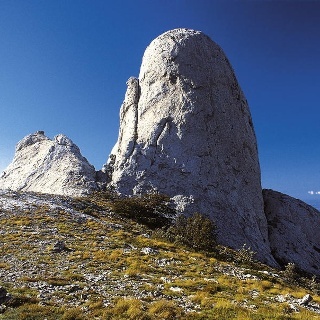 The only longitudinal trail in this area is the Velebit Hiking Trail. This section requires 5 hours of hiking. From the shelter and water cistern at Šugarska duliba, the route first takes us straight through the forest to the southeast, and then along the slope of Veliki Stolac (1406 m.a.s.l.) and across beautiful meadows to a road in poor condition leading from Rizvanuša to Panos (1258 m.a.s.l.) – a pronounced peak with a destroyed military facility. We continue down the winding road to the left for 2.5 kilometers (one hiking shortcut can be seen already after some thirty steps, and the next shortcut is at the second band), until we reach a place where a steep descending forest path branches to the right, leading to the remains of a ranger station in Jelova ruja (we can also take the road, which is a somewhat longer option). From the ruins of the ranger station in Jelova ruja, we continue by following the markings leading uphill to the pass above Jelova ruja. What follows is a climb through the forest to a mountain pass below Debeli kuk, not far from Stap. 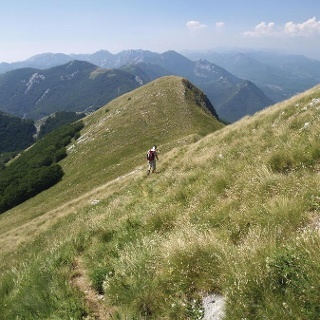 After that, we descend to Gornje njivice, where we come across a marked trail branch leading to the right to Debeli kuk (25 minutes of hiking) and then also across a branch leading to the peak of Čučul (20 minutes of hiking). 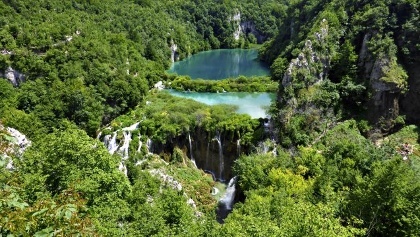 The trail briefly continues descending to Donje njivice, where there is a trail branch to the right leading to a unique stone called Čučavac (10 minutes of hiking). By continuing straight, we reach the mountain shelter Tatekova koliba at Stap in 20 additional minutes of descent. The pump at Tatekova koliba is working but there is a tip. You need to put first some water through the hole at the top of the pump to get enough pression. To do that you have a bottle of water close by. Don't forget to fill it again when you have finished for the next hiker.